When an insect spends most of its life in total darkness, it doesn't much matter what color it is. So, it comes as no surprise that so many species of bark and ambrosia beetles maintain the same brown hue as they slowly tunnel through wood and feed on a fungus that they carry with them into their trees. This similarity of appearance has been taken to an extreme in what has turned out to be a cryptic species complex. 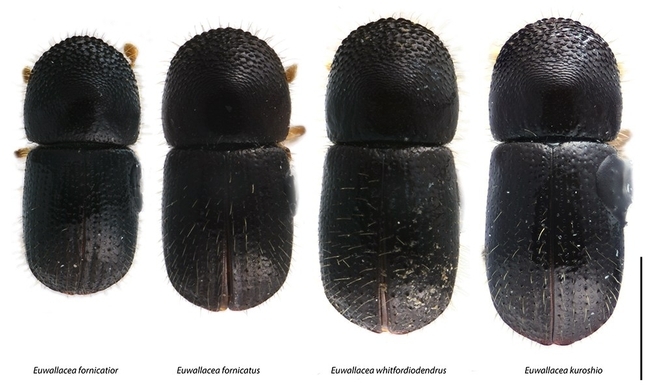 What was once referred to as the “tea shot hole borer” is actually four distinct species who all look almost exactly the same. The tea shot hole borer first attracted notice from North American entomologists when it appeared in Florida in 2012, appearing harmless. But the beetles were first described as an economically significant pest in Sri Lanka in 1968. In 2009, the beetles were found eating through avocado and street trees in Israel. Then, in 2012 in California, with a bang, avocado trees were being attacked and killed. Given the value of global avocado crops and tea plants, entomologists had to start taking a closer look at these beetles. Many taxonomists eventually came around to the idea that they were looking at three identical species rather than one: the tea shot hole borer (from southern Southeast Asia), the Kuroshio shot hole borer (originating in the Pacific Islands), and the polyphagous shot hole borer (presumed native to northern Southeast Asia). A 2017 paper authored by Richard Stouthamer and his team from the University of California, Riverside, first designated those three clades and established common names for them. Shot hole borers (SHB) and Fusarium dieback (FD) represent an increasing threat to many plant species in southern California. 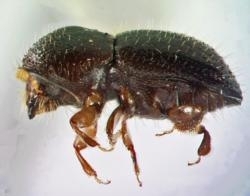 Two similar species of invasive shot hole borer exist in southern California, the Polyphagous shot hole borer (PSHB) and the Kuroshio shot hole borer (KSHB) (Euwallacea spp). 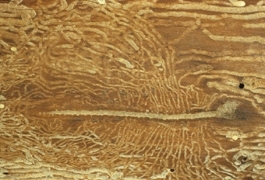 Shot hole borers are ambrosia beetles forming a symbiotic relationship with the fungi. PSHB symbionts are Fusarium euwallaceae, Graphium euwallaceae, and Paracremonium pembeum, while KSHB forms a symbiotic relationship with two novel species of Fusarium and Graphium (Cooperband et al. 2016) (Lynch et al. 2016) (Eskalen, Stouthamer 2015). These fungi clog the host's vascular tissue leading to branch dieback and eventually tree death. The beetles are not pathogenic in their native habitats in Southeast Asia, preferring instead to infect stressed trees (Hulcr and Dunn 2011). The two shot hole borer species found in southern California differ primarily in the fungal species they associate with but can be treated the same for the sake of management. SHB infestations begin when females burrow natal galleries into the host, introduce symbiotic fungi, and lay eggs. Females are capable of producing haploid male offspring in the absence of mating while mated females produce diploid female offspring. Eggs mature into adults in six weeks. Beetle emergence occurs over a period of weeks during the spring and summer. Dispersal of females to other hosts is primarily wind-driven, but is also likely facilitated by firewood and green waste movement. Males are incapable of flight; they remain on the host tree but may enter other natal galleries (Umeda, Eskalen, and Paine 2016). Beetle dispersal can occur over large distances if winds allow. The loss of wildland trees, particularly in riparian areas, poses a threat to numerous threatened and endangered species such as the least Bell's vireo (Vireo bellii pusillus). Destroyed forests give way to invasive species such as giant reed (Arundo donax) and castor bean (Ricinus communis) (Boland 2016). Specifics of this emerging threat are poorly understood and while research is ongoing this guide is intended as an identification aid for land managers in areas where SHB may not yet be discovered. Many growers don't hear about the amount of research and extension activity that is going on surrounding the Shot Hole Borers and Fusarium Dieback. This pest/disease complex affects not only avocados, but many other tree species, including many California natives. These are the notes from a Collaborative organized by UC ANR. There is a lot of energy by a lot of groups addressing this massive problem. No spread of invasive shot hole borer/Fusarium dieback (ISHB/FD) was reported this quarter, which may have been due to cool seasonal temperatures and resulting insect inactivity. The period served to establish new trapping sites, evaluate programs, and establish new ones. Trapping locations expanded in Orange, Ventura, and Santa Barbara Counties. A new trapping program was started that serves the Santa Monica Mountains, Conejo and San Fernando Valleys. An urban observational project modeled after successes in Orange County was initiated in Ventura County. The project can potentially expand monitoring by citizen scientists throughout the region to benefit tracking and treatment. o Media interviews about ISHB/FD were conducted for publications, many of which are circulated online. o The Tijuana River Valley is the first natural habitat to be substantially invaded by the KSHB. It first appeared in the valley in 2015 and almost immediately caused extensive damage to the riparian forests. It is estimated a total of 355,510 willows, or 88% of the population in the valley, have already been infested. More than two billion (2 x 109) beetles were born in the valley during 2015-16. This was likely the single largest production of offspring by this beetle in the US so far. o KSHB has not killed all of the willow trees it infested. Many heavily damaged by the KSHB during 2015 re-sprouted in 2016. In some sites, where the willow canopy was destroyed by the KSHB, there is now an extensive short canopy of re-sprouting willow “shrubs” up to four meters tall. o The Irvine Ranch Conservancy surveyed lower Agua Chinon at Limestone Canyon Nature Preserve in Silverado (northern Orange County foothills) and found no signs of PSHB. 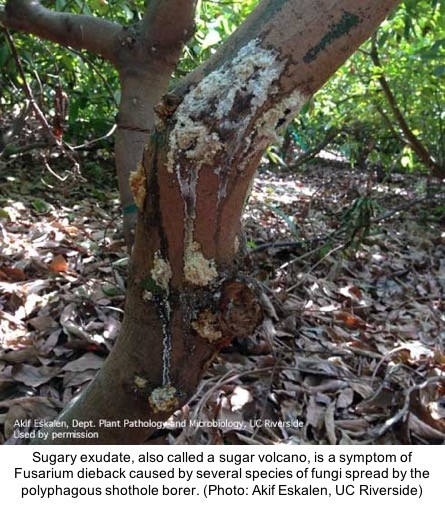 However, 12 potentially infested trees were identified in Bommer Canyon Community Park, Irvine (near Turtle Ridge) with samples taken and submitted to the Eskalen Laboratory at UC Riverside. Of those 12, five were surveyed last year and found to be newly infested this year. The other seven are newly surveyed this year. o Inquired about trunk injection of pesticides on creek banks and in dry creek beds. CDFW pesticide unit was consulted. Learned that applications consistent with label instructions are alright to use, as long as trees are not growing in the water. Can be okay if next to water. Said ecological risk outweighs risk of insects. o The Southern California Green Waste-Wood Biomass Symposium was held February 9 at the Handlery Hotel in San Diego. 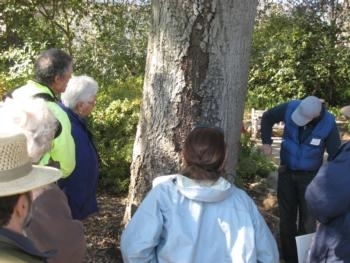 Members of the Emerging Tree Pests Education and Outreach Committee coordinated the day-long event. It was intended to engage multiple industry and practitioner stakeholders from public and private sectors, along with researchers and policy makers. Discussions on how to best address larger regional issues related to managing residual materials of invasive pest infested and dead trees were the focus. For more information, including presentation slides see http://ucanr.edu/sites/SoCA_GWWood__Mgmt_Symposium. 108 individuals attended, with a 54% evaluation survey response rate. Co-presented with Gina Moran (CA State Parks) on Invasive Tree Pests including ISHB/FD, gold-spotted oak borer and South American palm weevil, February 28, 2017, La Quinta, CA.